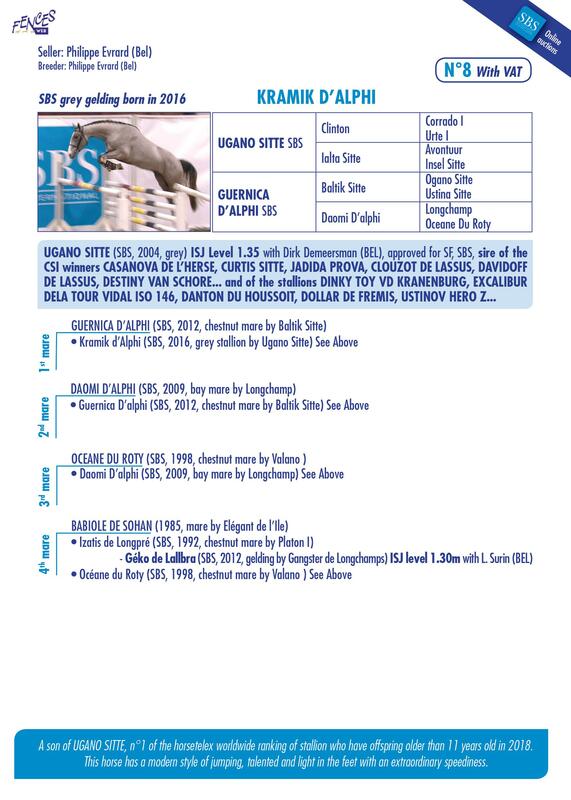 This sale is from 8 to 11 march 2019, in exclusivity on Fences Web. To place a bid, you need a bank pre-authorization of 500€. We strongly recommend that you register as soon as the sale opens. Don't wait until the last minute to place your first bid and activate your account! Still green at the selection, she demonstrated many good natural qualities. 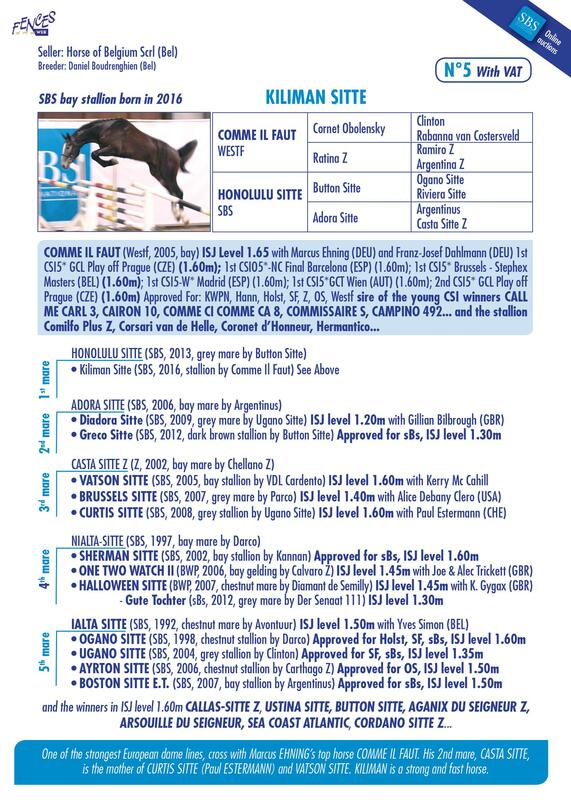 Future stallion, son of the talented CORNET OBOLENSKY and the sister of OGANO SITTE and UGANO SITTE, both are well-known stallions. KARJAN is very respectful and very skilful. 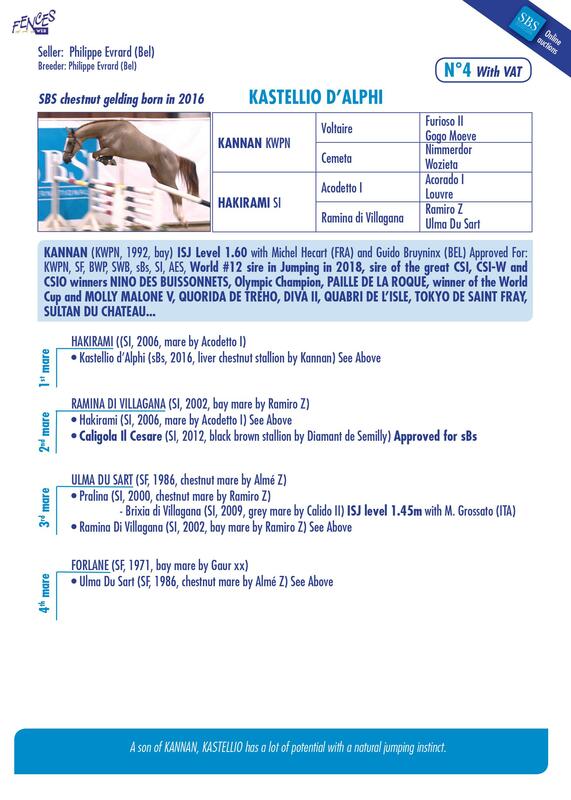 A son of KANNAN, KASTELLIO has a lot of potential with a natural jumping instinct. 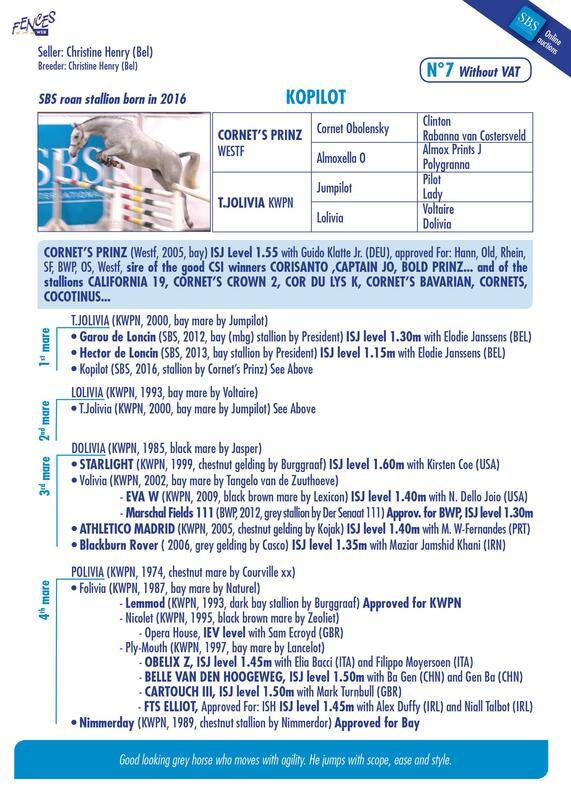 One of the strongest European dame lines, cross with Marcus EHNING’s top horse COMME IL FAUT. 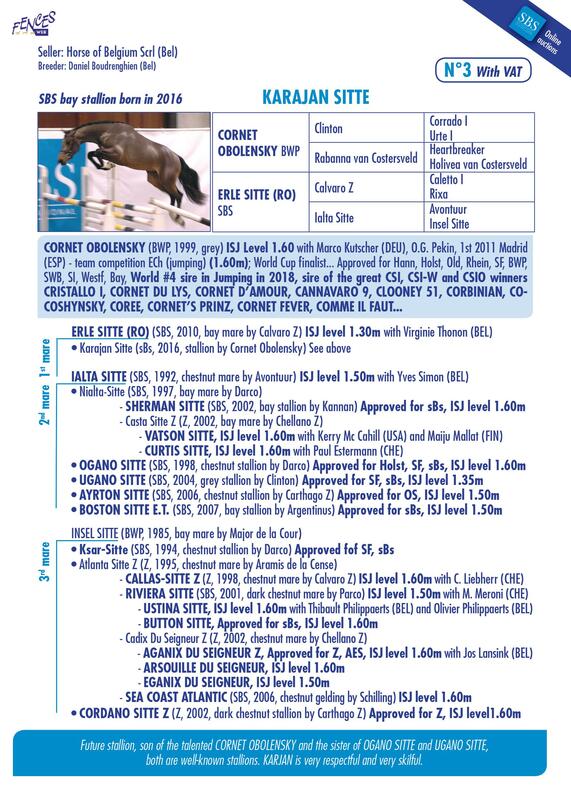 His 2nd mare, CASTA SITTE, is the mother of CURTIS SITTE (Paul ESTERMANN) and VATSON SITTE. KILIMAN is a strong and fast horse. 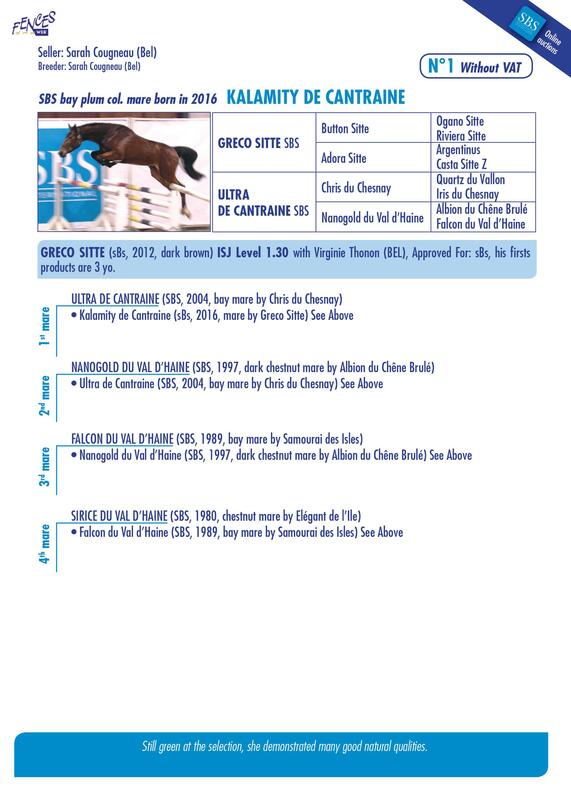 Son père UGANO SITTE (Clinton) est n°1 mondial selon le classemet HORSETELEX des étalons dont les produits les plus âgés ont 11 ans en 2018. Kingston possède un impressionnant passage de dos et est issu d’une souche qui produit régulièrement des chevaux de concours. Good looking grey horse who moves with agility. He jumps with scope, ease and style. 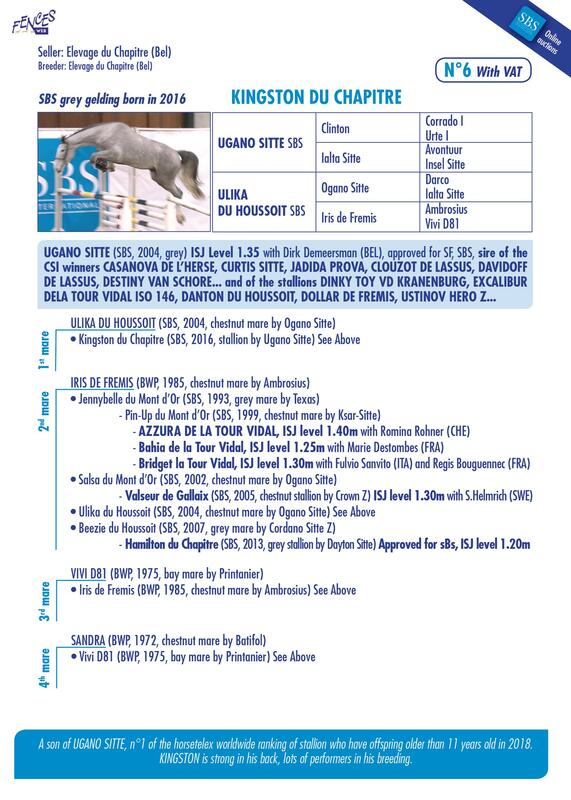 A son of UGANO SITTE, n°1 of the horsetelex worldwide ranking of stallion who has offspring older than 11 years old in 2018. 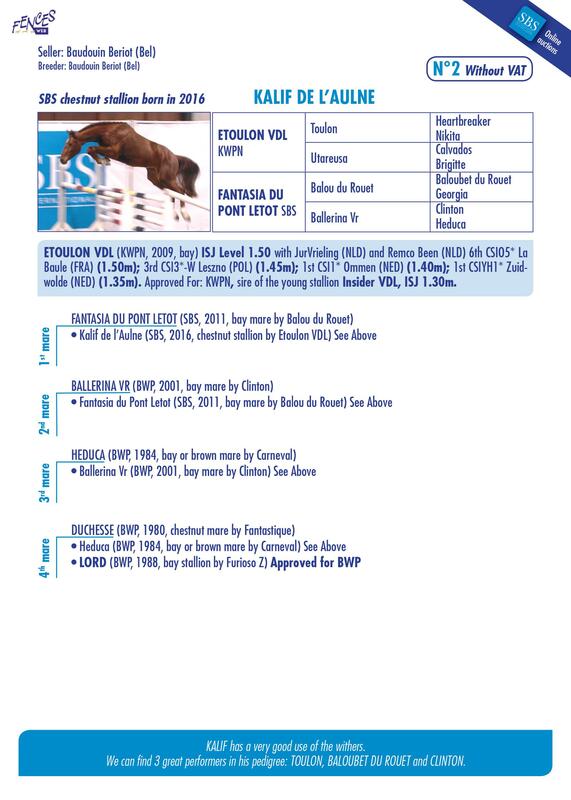 This horse has a modern style of jumping, talented and light in the feet with an extraordinary speediness. 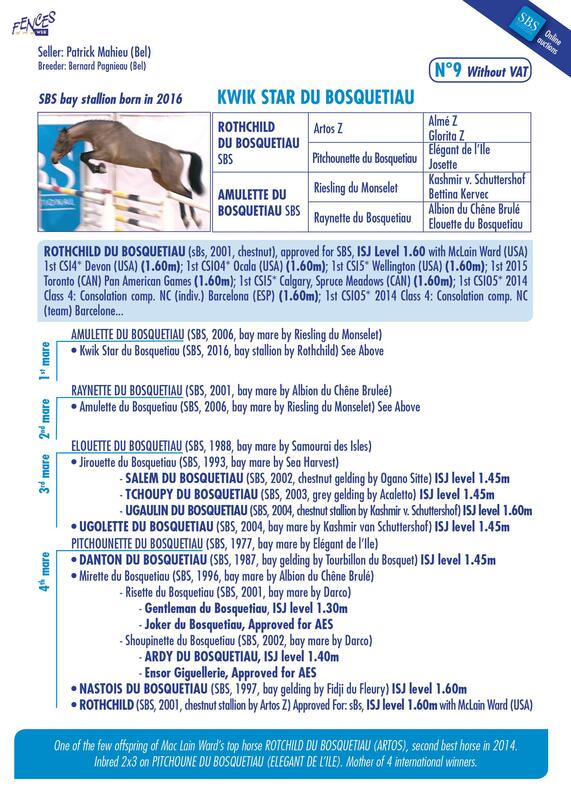 One of the few offspring of Mac Lain Ward’s top horse ROTCHILD DU BOSQUETIAU (ARTOS), second best horse in 2014. 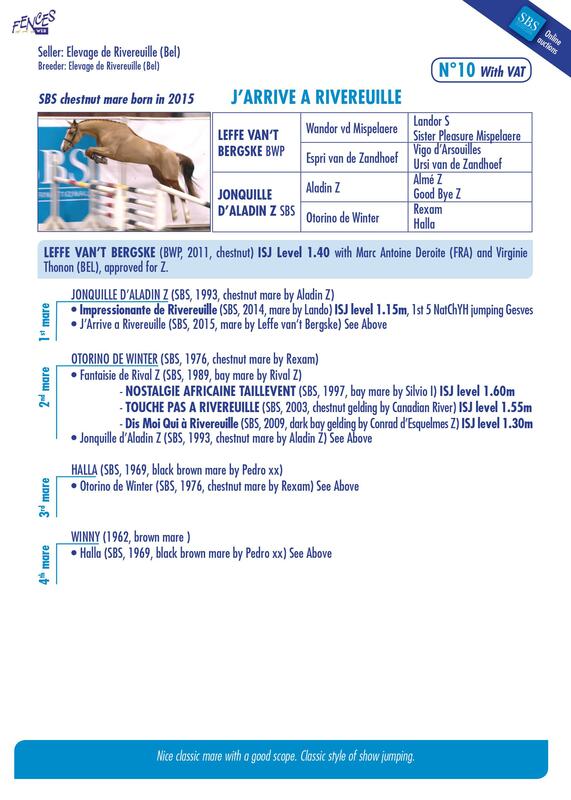 Inbred 2x3 on PITCHOUNE DU BOSQUETIAU (ELEGANT DE L’ILE); mother of four international winners. Nice classic mare with a good scope. Classic style of show jumping. 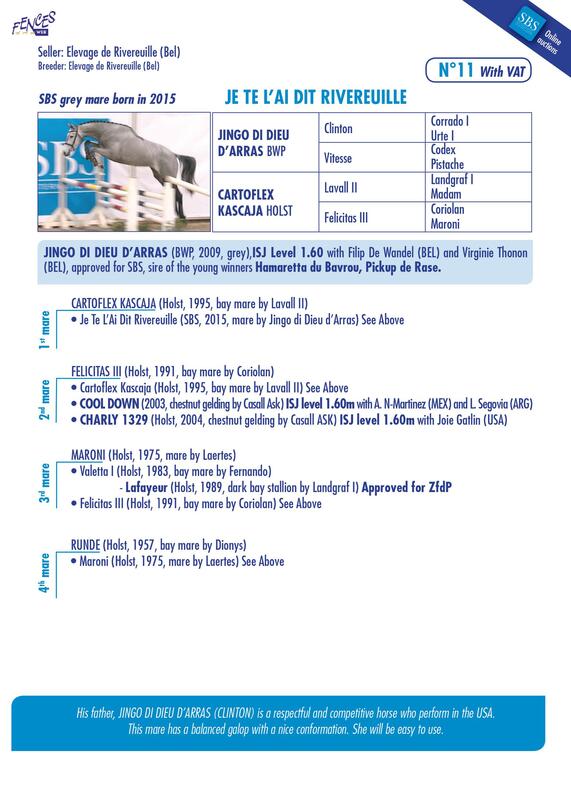 His father, JINGO DI DIEU D’ARRAS (CLINTON) is a respectful and competitive horse who perform in the USA. This mare has a balanced galop with a nice conformation. She will be easy to use. Ce cheval pie s’est illustré lors des plus grands concours de saut en liberté à 2 ans. Son père FIDELGO DU HOUSSOIT fut champion de Belgique à 4 ans, Champion des 5 ans et 6° des 6 ans ! JET SET saute déjà très facilement en parcours sous la selle. 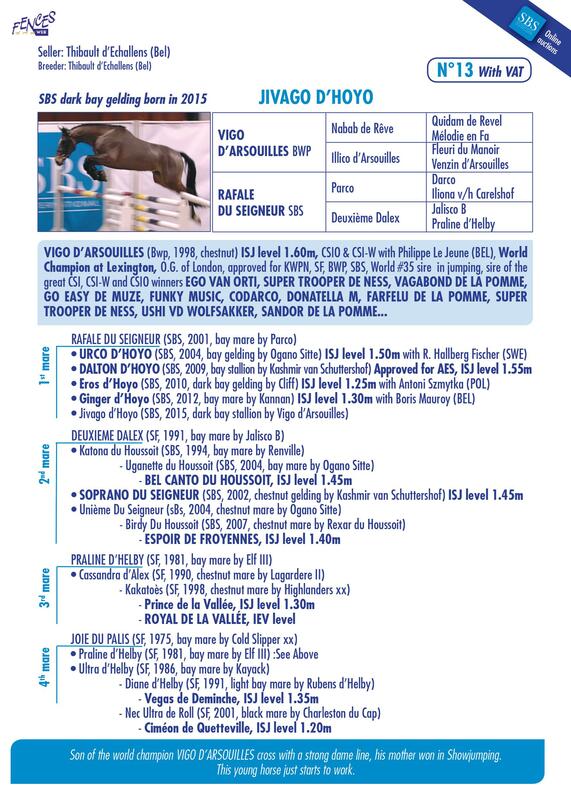 Son of the world champion VIGO D’ARSOUILLES cross with a strong dame line, his mother won in Showjumping. This young horse just starts to work. 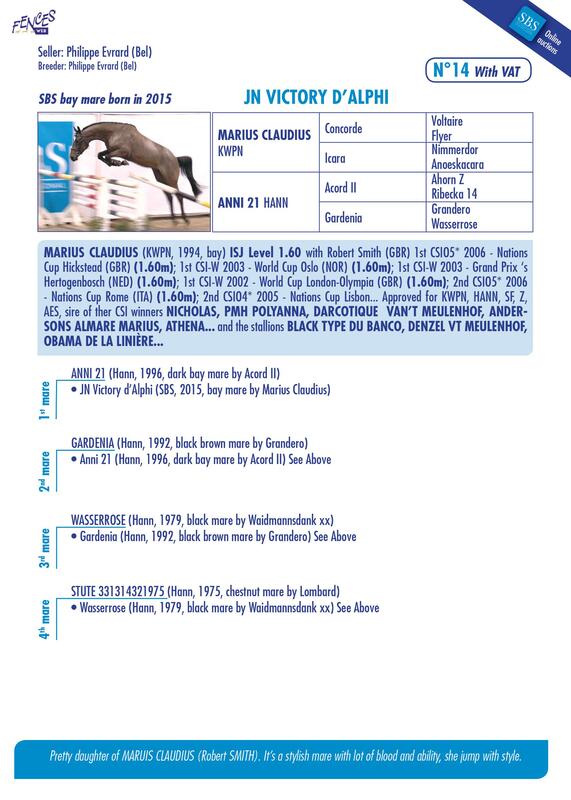 Pretty daughter of MARUIS CLAUDIUS (Robert SMITH). It’s a stylish mare with lot of blood and ability, she jump with style. 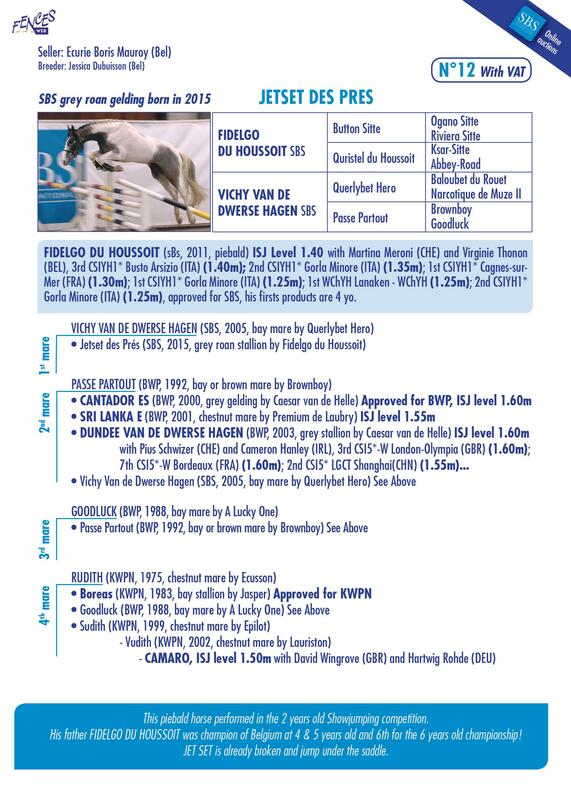 Attractive mare, with lot of potential and a perfect ability of show jumping. Very competitive, she just starts Showjumping competitions. 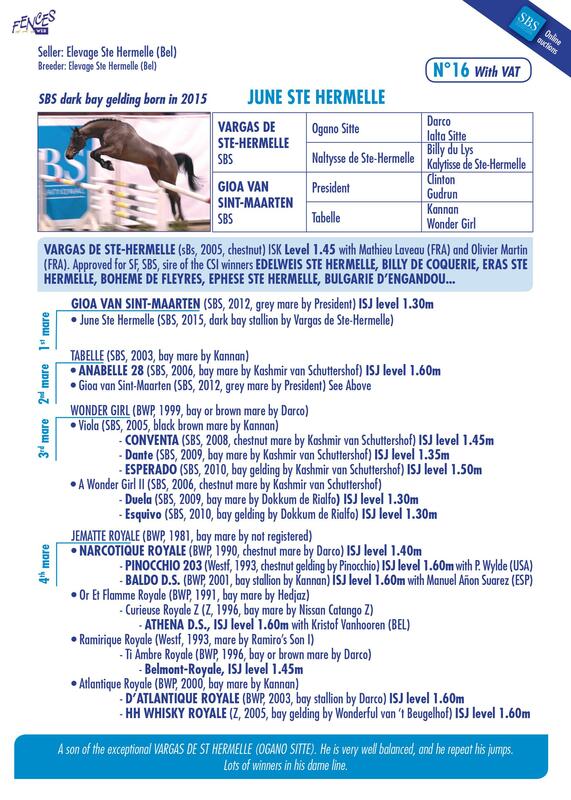 A son of the exceptional VARGAS DE ST HERMELLE (OGANO SITTE). He is very well balanced, and he repeat his jumps. Lots of winners in his dame line.